The folks at the Boston City Archives wonder if you can place this scene. See it larger. My thought the minute I saw that roof line. Notice the business to the right. If you Google the phrase 140 "g. l. fisher" you get old city directory pages with that business at 140 Dudley St., Roxbury. And itt's not just a "trolley station" it was a transfer facility between the elevated rapid transit (Orange Line) and the local streetcars, and part of it remains today as the old train shed that has been repurposed to cover the existing bus transfer facility. Dudley -- the inclines for the trolley tracks going up to the elevated level give it away. Dudley had cross-platform transfers between trolley and the El. 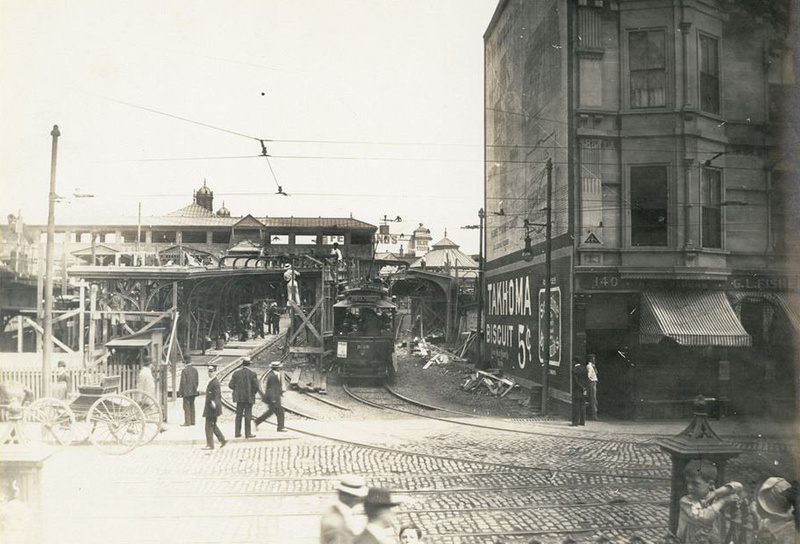 The only other elevated terminal station at the time was Sullivan Sq. but I believe that station did not have trolleys going via inclined ramps up to the same level as the El. Sullivan Square station did have a trolley ramp going to the upper level, but it didn't look at all like the Dudley ramps. It was on the north side of the station and served trolleys coming from Broadway and Mystic Avenue, including the famous Fellsway line. Most of the station's trolley routes, however, came in from the south, or from Everett; and these all stopped at the lower level. ...on the right. Ferdinand's in the background behind the station where the BPS building is now. Yum, Joe's Famous Steak is the best! Now I'm totally jonesing for a #4 Regular. Near Mass Ave end. The building is still there. Feels like a step back into time. Really one of the most historically atmospheric spots in the city. (And when the incense vendors are burning full blast, I do mean - atmospheric.) It's a shame that it's terra incognito to so many people living in Boston. Old Dudley Station is my first guess. Otherwise, maybe Massachusetts Ave near Albany Street.